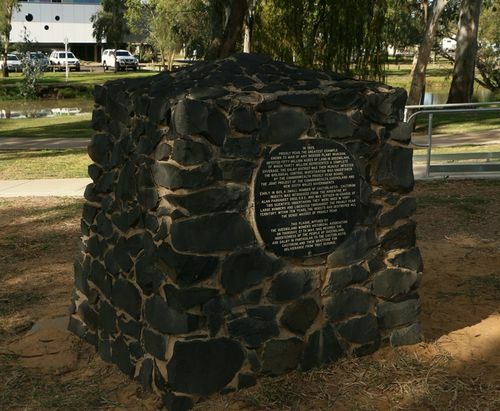 Cairn pays tribute to the cactoblastis moth and the scientists who waged war against the prickly pear which once threatened to destroy the whole of south east Queensland. Locals were at first sceptical that the Cactoblastis grubs and Chico-cochineal insects could destroy the prickly pear. However, once convinced, they contributed enthusiastically to spreading millions of `egg-sticks` as they were called. In three years thousands of acres were cleared and thereafter one could only grow the pear if it was covered with a protective net. A land area larger than size of Tasmania was recovered for farming purposes. Not so many years ago ,people In the Dalby district referred to events as or BC or AC, before or after cactoblastis. In 1925, Prickly Pear, the greatest example known to man of any noxious plant invasion, infested fifty million acres of land in Queensland, of which thirty million represented a complete coverage. The Dalby District was then heavily infested. The biological control investigation was undertaken by the Commonwealth Prickly Pear Board, the joint project of the Commonwealth, Queensland and New South Wales Governments. Early in 1925, a small number of Cactoblastis Cactorum insects was introduced from the Argentine by Alan Parkhurst Dodd, O.B.E., who was officer-in-charge of the scientific undertaking. They were bred in very large numbers and liberated throughout the prickly pear territory. Within ten years, the insects had destroyed all the dense masses of prickly pear. This plaque, affixed by the Queensland Women`s Historical Association on Thursday, 27th. May, 1965, records the indebtedness of the people of Queensland, and Dalby in particular, to the Cactoblastis Cactorum, and their gratitude for deliverance from that scourge.